This is going to sound like I'm totally insane, but you'd never believe where I got my inspiration for this blog from...Wait for it...a Holden ute! Now before you start thinking I must be some kind of mad fashion-loving-come-motorhead, the colour of the ute was the gorgeous deep, purple colour imaginable. So the story continues down the track, with this colour embedded in my memory. One night, I was surfing the Internet in my down time, as I do. It's my way of chilling out after a very hectic day of teaching primary-aged children. I checked out Chanel's Ready to Wear collections and their runway videos, my favourite being AW '12/13. Low and behold, what did I see? 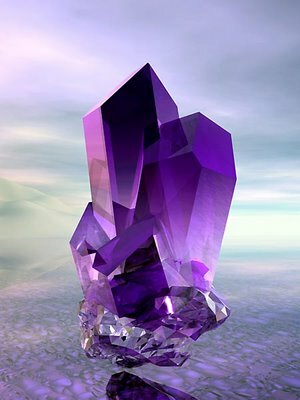 Amethyst crysals! What colour were they? The colour purple. Anyway, I've posted the video link for you below so you can experience some of Karl Lagerfeld's creative magic for yourself. That man is a pure genius! What's the most bizarre place you've found your inspiration? Enjoy your weekend my lovely readers! Hi Lola! Thanks for your comment! 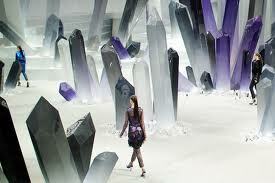 Chanel have integrated this gorgeous colour purple perfectly into their AW '12/13 range, thanks to Karl's sheer genius. Thanks so much! Welcome to my blog!! I'll come & have a look at your blog too. Glad you enjoyed watching it!! i find inspiration in skulls and skeletons! i know it sounds creepy, but i love to draw skulls! OMG! This first stone looks amazing! I love amethysts. They've always been my favourite stones. Stunning stones and Karl is genius!